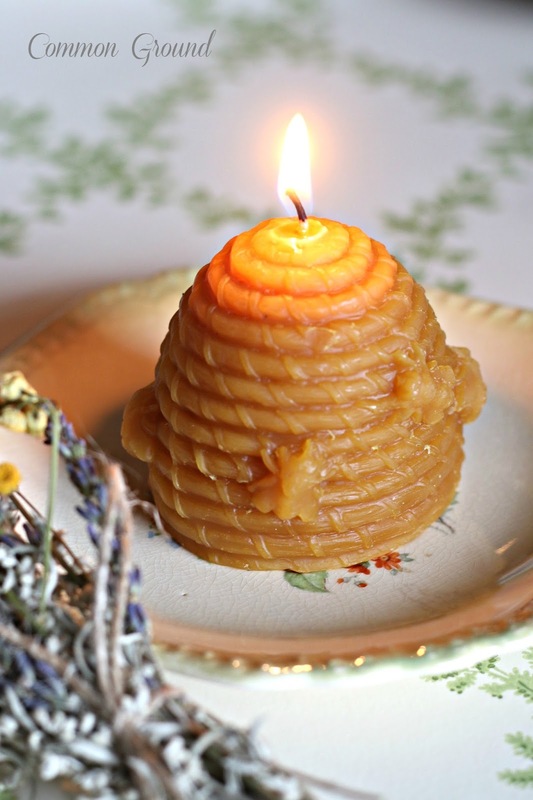 Before I tell you about my week, I want to tell you about these wonderful (I have two) little beeswax candles that I ordered along with a bee skep for my baker's rack. I had been feeling pretty down and these were waiting for me when we arrived home. 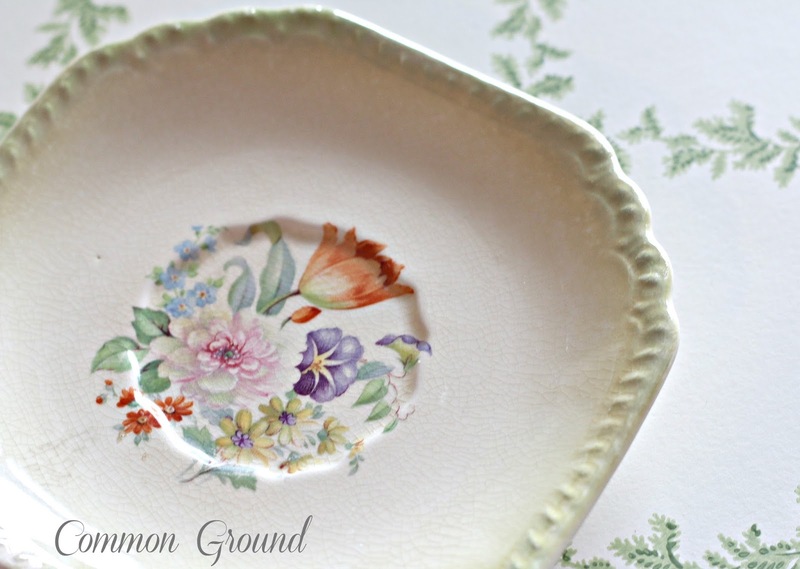 I'll share the bee skep soon, but thought this little vintage floral saucer said "Summer" right along with a sheet of vine-y greens from my wallpaper sample books. 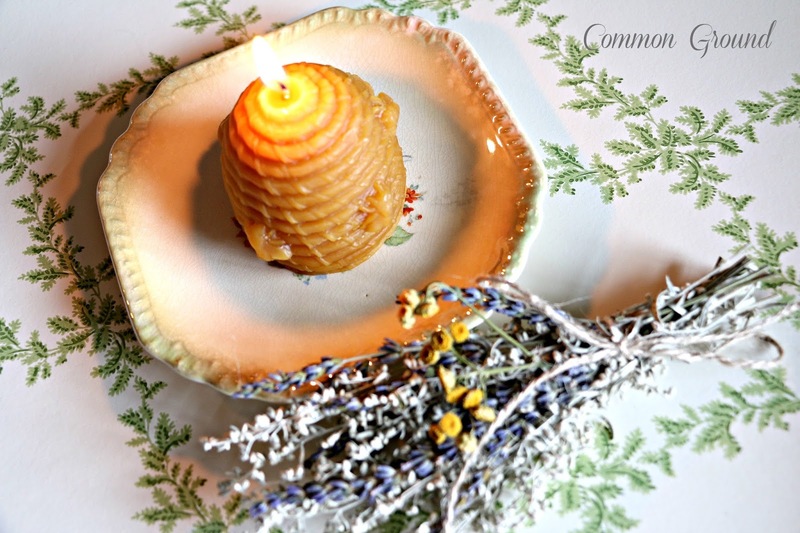 and some cinnamon wax melts. but the other's must be packed away...somewhere. OK, so back to my last week. We headed to my appointment in St. Louis with my new cardiologist and she was everything I had hoped for...articulate, informative, intelligent (of course), friendly, listened to what I had to say, had read through all my stacks of records that had been sent to her...and she was also funny and relateable. She's the kind of person that I'd like as a friend. So, she set me down and drew out a diagram of what she could tell about my heart and all the "workings" of my specific arteries, veins, and other important aspects of my cardiovascular system. She apologized for her lack of artistic talent, but told me more in 20 minutes than my other cardiologist had in 12 years. She tried to get me in for a heart catheterization the next day, but because of this 4th of July holiday, it will be next week. So we go back and see what's currently going on, then. She has already said that open heart surgery will be needed because of an artery that is not working well. (a new one will be grafted in) With cardiovascular disease, I've had several calcified arteries that "wear out" too quick, so that has to be replaced. (they take a vein from my leg to replace it) yuk, I know. The rest of the problems will be better seen next week during the procedure. But I feel like a hundred pound weight has lifted off of me. I have hope for a better quality of life, and it was refreshing to have a doctor that actually listened to what I said and then answered my questions, and felt I deserved to actually have my issues addressed and corrected. It was a good experience and I'm so glad I followed God's leading and waited for the right doctor and timing. I've just started this new part of the journey, but having "hope" means everything. I've said it before, but it's worth it to stress...if you are unhappy with your doctor or caregivers or don't feel like you're being "heard" please don't give up. Find a way to see a specialist. It can literally save your life. So glad you found a great doctor…praying for you, Debra…God will see you thru this! You must be so relieved and happy to have found such a caring and intelligent doctor and I am so glad for you. All the very best in your next step towards a healthier heart!! Debra...not sure I have ever posted but have been following your progress.I am so pleased you finally found someone who will listen and you feel confident in! I hope all goes well! Just so you will know, my grandmother had a quadruple bypass in her 50s...I was young then but remember it well! She lived a VERY long and active life after the surgery and that was 30 years ago when medical science was not nearly as progressed as it is today! You will do well...please keep us posted...as you noted, sometimes life isn't always about pretty china and frilly wreaths. You have a "web" of friends who care and are praying and who are truly concerned! Debra you will be in my prayers. I'm glad you found a wonderful doctor. It makes things so much better. Be well and please let us know how you are doing. I will be praying for you Debra. So glad you found a doctor that had all the qualities you listed. They are truly hard to find!! Enjoy the 4th and do let us know how you are doing when you are able to. Blessings to you and your family!! I am so glad you went to see this doctor. When you meet the right one it is a great relief. I have been seeing doctors and being with nurses lately, and I am so blessed that we have people with so much caring and knowledge. I went to a garage sale and their was a nurse and she was in Sudan this past year to help with vaccination and the children. I am fortunate that we have great hospitals in my area. The hospital I have been going to is just for women. 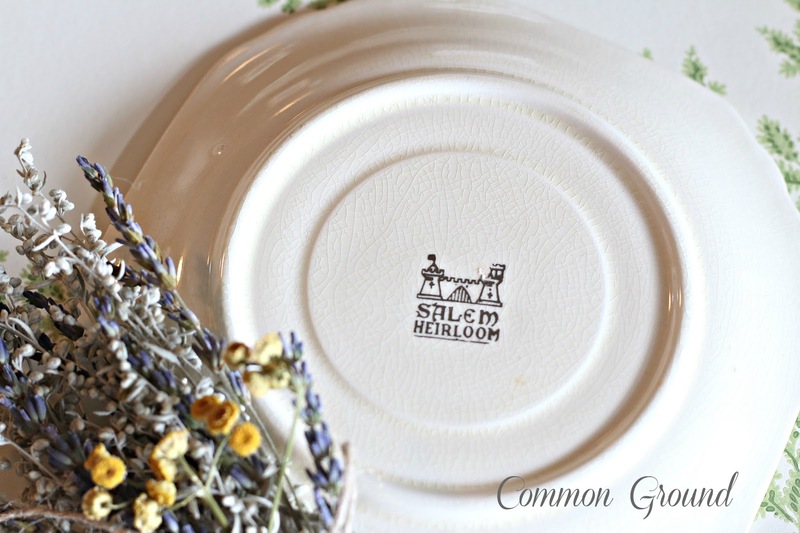 I love your plate and that honey wax candle is so sweet. Get through the next week and you will be in my prayers. My prayers are with you Debra. I'm thrilled you found doc that you feel safe with.. Thats so important to your healing..
as for entertaining folks- to heck with that~! all most of us want is to share this time with you and be as much support as possible so dont worry about putting on some project display... Personally I'm kind of tired of that and wish for the old days when we could just share ourselves versus what we'd bough or done to our home. healing thoughts and loving light to You..
Glad the appointment was good and the new doctor is one you like. Good luck next week and we will all be thinking of you and sending good thoughts! Thank you fro taking the time to share your prognosis. It is a relief to find someone who understands exactly what you need. My thoughts and prayers are with you at each step of this new journey. 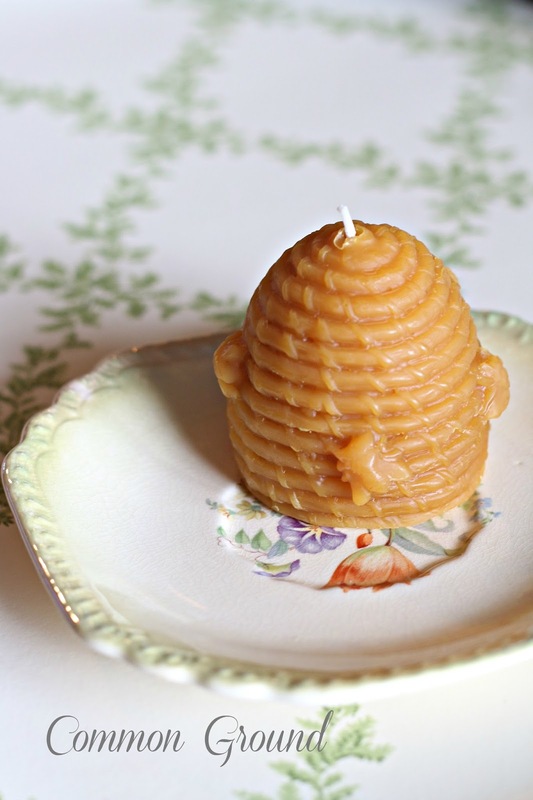 Also thank you for this post of beauty - it makes me happy to see the little beeswax candles on the floral saucers. I'm so glad your appointment was all you had hoped for, Debra. It's never a waste of time to change doctors until you find the one that's right for you. I did the same when it came to my hearing loss. I chose to see a specialist at the Mayo Clinic who I felt very comfortable with. He didn't give me the answer I had hoped for, but he spent time with me explaining things better than the other 2 docs did at my 3 minute appointments, so now I just have to accept what I was told. Your new cardiologist sounds as if she's very optimistic about your future, and I couldn't be happier for you! I hope your procedure goes well and helps relieve the stress you've been under. 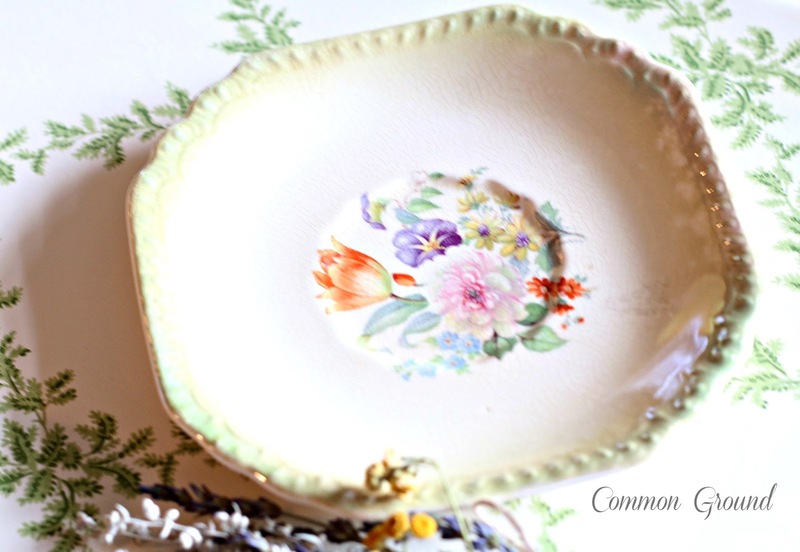 The beeswax candle is sweet and so is the pretty summer plate. Thanks for keeping us updated and I wish you all the best. Hi Debra, I'm so glad to hear that you found a such a wonderful doctor. It's so important that you are confident. Wishing you all the best for the angiogram and the further treatment. Have a great and relaxed Sunday! So thankful that you have found a wonderful doctor. Still praying for your complete restoration and recovery. I check in every day, I am so glad you have found a doctor who can help. I am so glad to hear you have found a great doctor. I see a neurologist and for years I struggled with uncaring doctors until I found him and then I felt something I had not felt in a long time...hope. It means the world to have such a doctor. I pray that your procedure goes well and that you have a swift recovery. Fantastic news of finding your professional with the qualities and skills that lift the stress and give you confidence and hope! Best wishes for continued progress on this road, Debra. Hope is such an important part of recovery. I am so thankful that you now have found a doctor who truly cares about her patients. I'll be keeping you in my thoughts and prayers this week. You sound very up beat and ready for this procedure to help you to live better… Thinking of you and wishing you an easy time of it all. Doctors do this stuff all the time with wonderful success. Take good care. Prayers will come your way. I am so pleased you found a new cardiologists! I wish the best for you and you will be back to decorating really soon. This sounds like such a positive step and I am so happy for you to be gaining your health back. Prayers for your speedy recovery! What a relief it must be to have found the right cardiologist. Thank goodness! You are in my thoughts and prayers, Debra. Sending lots of love and good mojo your way Debra! The right Dr. makes a BIG difference. Continued prayers for you ask you go through this procedure Debra. It sounds like you have found a great doctor, Debra. I know that can be a big deal, having searched for a primary care physician for a long time that would actually listen to me. Of course, we moved so I lost her, but it made me realize you don't have to put up with certain types of doctors and health professionals. It is a bit scary, but you are probably glad to know there is a "plan" to move forward. Lots of good thoughts and a "hug"! So good to see a post from you in my newsfeed. I have been missing them (even though I don't comment every time) and have been wondering how you were doing. Glad to hear that you have a great doctor! Prayers and hugs. Wow so glad you found a great cardiologist. I can tell you from being a nurse for many years that as soon as they replace the closed artery and put the new one in you are going to feel like a whole new person. It is amazing how our bodies compensate for lack of the blood flow to the heart but once that is corrected Oh my Gosh you are going to feel so much younger and feel so much better. Your energy levels will rocket and you will feel a spring in your step. The open heart surgery is done with as minimal invasiveness as possible and you will be up and feeling so much better almost immediately. After a few weeks of healing and starting some rehab you will feel like a teenager again just without the acne LOL! My prayers and hugs are sent to you. I am a big believer in prayer and I will keep you in mine. Good luck sweet friend. Hoping for really good news from the angio. Debra, It is amazing how I crossed your path today. I lost my blog roll and decided to blog hop from blog addresses I know by memory, read their blog roll and make a paper list of the blog addresses. Yours was the first one I came to. For some time your blog has not been updating as were some others and I have not visited you in a while. I think you know how hard it is to visit so many blogs and I have been doing many other things with life so needless to say I am behind with everyone. All this aside, I will be praying for you. You are a dear sweet sister in our faith.I am very glad you have found a new doctor and have a plan to be helped. Glad to hear you are happy with your new doctor and she is easy to communicate with. - makes a big difference. Debra, I ,m so glad you now have a wonderful doctor in your life..I don't blog anymore but still enjoy reading them..you have always been one of my favorite blogs to read..
You are in my prayers Dear friend, I had a triple by_pass and heart valve replacement 2 1/2 years ago..they also to the veins from my right leg..I will tell you the incision is only about an inch long..
Now the chest part took almost a full year before it closed..the best advice I can give you is get plenty of rest and try and push yourself.. I still walk as much as I can..I also don't push myself any more..than is why I quit blogging as it was putting stress on me to always get a post ..there were so many other ways I wanted to spend my time than sitting at the computer all day..I felted God gave me a second chance to enjoy my family and friends and I wanted enjoy it all..
How beautifully you share your life with us... You have been in my thoughts...wondering how you are.. 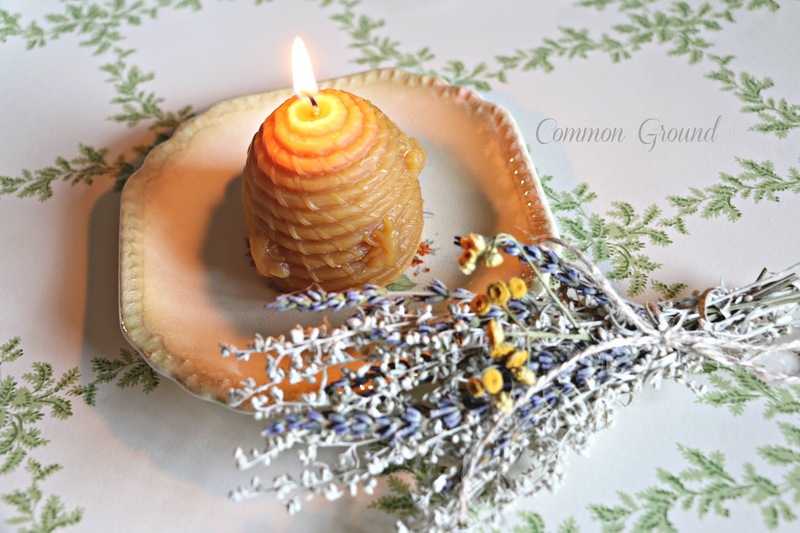 So, I was so glad to see today's update on your progress, good news regarding your health interspersed with beautiful photos of the little bee hive candle. Glad you are happy with your new doctor, will be praying for you. Sending prayers your way, Debra. Your Doctor sounds like a wonderful person, and the fact that you could relate to her so well will certainly help in your recovery! My sister-in-law and brother-in-law have both had to go through heart surgery like yours, and are doing fine. We've come such a long way in medicine. Take care of yourself, don't worry about your blogging activity. . .we will all be here for you. Glad you've found a doctor you feel has some answers for you. You are in my thoughts and prayers as you go forward with the decisions ahead. Take care and know that your friends keep you close in thought. Dear friend, my own heart jumped with excitement for you that you will finally be getting the help you need!!! My prayers will continue as you begin this next step towards restored and renewed health!!! I appreciate the update and I, too, sense your peace!!! The lighted candle is such a testimony of your current situation. Debra, you are so sweet to keep us updated. I'm so glad you found a doctor you love. That will make a huge difference. Praying that all goes well. I am so very happy to hear that you have found a doctor that would listen to you and that things are going to get much better for you. I will be sure to keep you in my prayers and please keep us posted on how it's all going for you. So glad I popped over for your update. I am beyond thrilled that your new Dr actually listened!! Woohoo!! I know it feels wonderful to have that kind of a connection!! May God continue to fill you with hope and peace as He shows you how He is going to work this all out for you!! Remember that He goes before you into each new day...something I find great comfort in here lately. Love you bunches, and will be praying for all that concerns you. You're a joy and delight to me and so many others!! Debra, there is nothing more comforting than to find a doctor that you trust and is understanding. I'm 62 and two years ago I had a pacemaker implant. His care is what got me through the ordeal. I'm not blogging much these days, I'm on chemo treatments weekly now and I'm just happy to read everyone's wonderful posts. Your blog I've followed for along time. I'll be praying for you as I know many will be too. You are one special lady to many. Take care, know you'll be okay. God will bless and keep you safe. God is good! Having a doctor who is caring and that you can relate to is so important. It's a must when going in for surgery. I wish you a speedy recovery. Modern medicine is amazing. Add that to a good doctor and a good positive attitude and you'll be up and around in no time. That's great news! I'm glad to hear that you're seeing a good doctor and have plans for the next step. I hope that everything will continue to go well for you. I haven't had to deal with any of that for myself, but I have had to deal with it with my husband, his dad and a friend of ours. I know how scary it can be. Just keep the faith that everything will be ok. Positive thoughts for a positive outcome! Waiting on The Lord is not easy, especially in matters of health... I pray that the peace of God will overflow your heart and mind... and that the surgery and recovery will will be great. Debra, I'm happy you found the right Cardiologist! I'm sending hugs and prayers your way that God will keep you in the palm of His hand and heal you quickly. You will be missed! I couldn't agree more! It's so important to shop for a different Dr. If you don't feel you're getting the information you need. I have a couple friends that have had the same surgery. One has had it a few times due to it being a genetic problem. It definitely returned their quality of life. Thank you for the update. You're in my thoughts and prayers. It love wallpaper too!!! 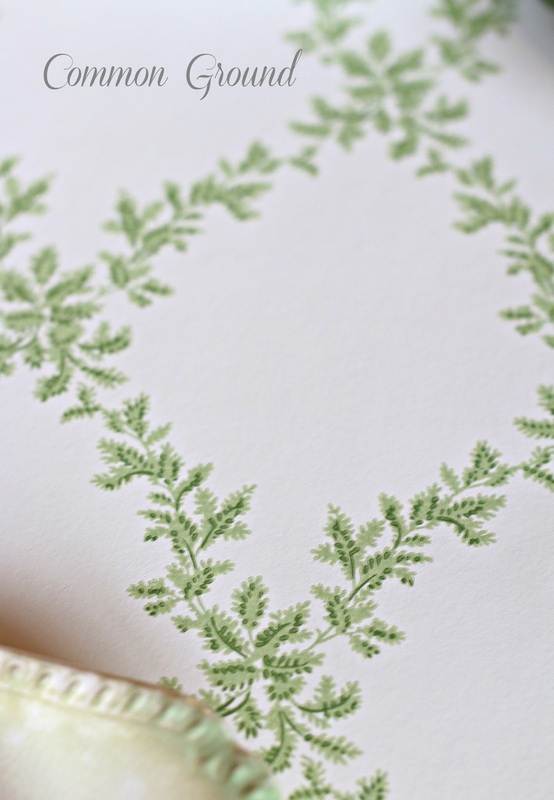 I love wallpaper too. Love this ipad but miss having a normal keyboard!!!! It's much better to know what's going on in order to plan our next step - so glad you can feel more at peace addressing your health/heart issues with the right doctor by your side. Take care and all the best to you! Thank you so much for the update Debra. I continue to keep you in my prayers. I think of you often. Even though we live close to the wealth of medical expertise, in St Louis at present, it is one reason we are in the process of moving even nearer to the city. We are grateful for these wonderful physicians and facilities. Not only J, but I too have been helped so many times and our family as well, over the past 50 or so years. Many of our friends from across Missouri have traveled to St Louis for care. You will remain in my thoughts as you continue this journey. The confidence you've found in your new doctor goes a long way in adding to your peace of mind! I've been very inspired reading your blog and wish you the very, very best! I live in St Louis and am proud to know you've found the right doctor here! So glad to see an update from you, Debra, and that it contained that wonderful word-HOPE!!! We all will continue to pray for strength and blessings that will carry you through this journey swiftly, easily, and with a terrific outcome. So glad you found a Doctor you are comfortable with; what a gift for heaven. Life is mysterious and miraculous at the same time. Happy July 4th. God Bless the USA. So happy to hear you have found hope! Such a plus when dealing with life's hard times. You are in my thoughts and prayers. Waiting to hear from you again. 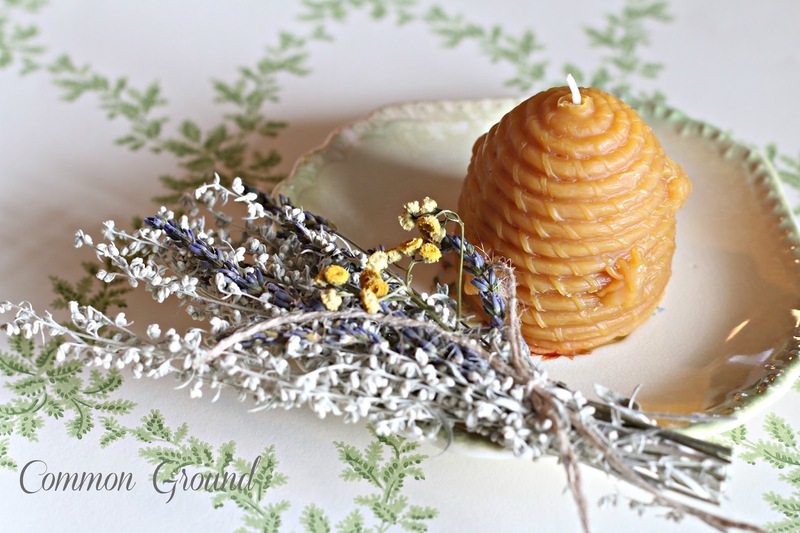 Having confidence and liking your physician/surgeon is half the battle...so happy that you were impressed and pleased with her so you can move on to the next level of your treatment and surgery...You will be in my thoughts and prayers!....and love the bee skep candle...beautiful...Have a wonderful day! Just checking in to see if you have an update...and you do! What a blessing to know you have found someone who has put you at ease and is so informative. I know personally it is better to handle things if I understand them. That's half the battle sometimes. It sounds like there is a logical plan ahead. One day at a time! I trust the Lord will help you with each step. Thankfully we still have some freedoms of choice left in this country regarding medical treatment! I wish you the very best. You have been and will be in my prayers. Have a good July 4th holiday this week. Oh Debra I have tears in my eyes as I read this. I understand how you feel about having hope, I so can relate to this since I went through this last year. My hope didn't come from traditional medicine but from eastern and alternative. But once I got that hope I slowly improved. I am so happy you are so please with this Dr., so many times they don't listen to us, it's that old school mentality they need to get rid of. Even though you have much to go through there is hope you will have your life will once again be full. You are often in my thoughts and my prayers. I do consider you a friend, and as a friend I am here for you. I'll follow you whether you decorate or not, for you are a special person Debra, your faith in God helped me more than you know through my sickness last year. May God keep you safe! I have just said a prayer of thanksgiving for this doctor. Such a one is truly a God send. Keeping you in my prayers and heart. Oh yes, having the right cardiologist makes all the difference in the world. I put off having a heart proceedure until I found a specialist I could trust. So glad you are on the right track now. We will follow you through your recovery and cheer you along as things slowly get better for you. God bless! Isn't it exciting that God sent you just the perfect doctor to understand your needs and can fix your heart! Please continue to let us know how you're doing. 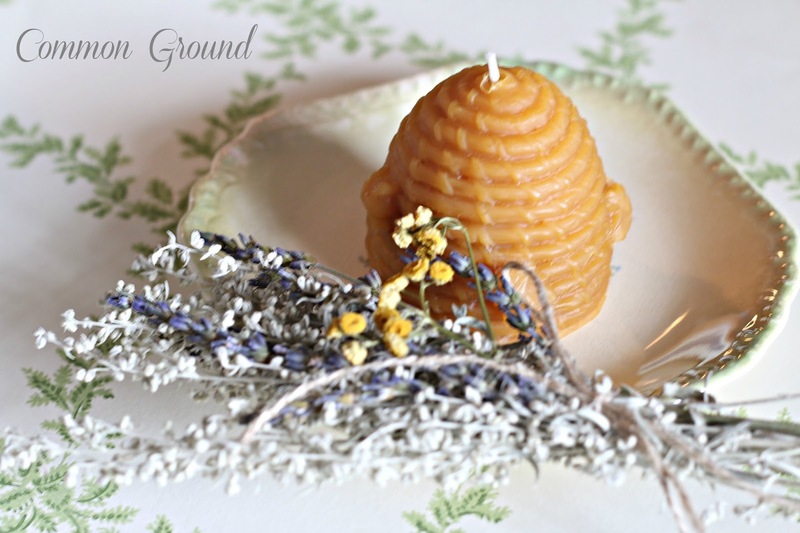 Your little bee skep candle is so sweet with the saucer and little herb bundle. I'll keep you in my thoughts and prayers. YAY! I'm so happy to read the good news, and will wait expectantly for even MORE good news. Hope is crucial, so bless your sweet new doctor for sharing her knowledge, artistic skills and time with you. All the best, Debra. DEBRA, YOU HAVE BEEN IN MY THOUGHTS AND PRAYERS SINCE THE BEGINNING OF THIS JOURNEY. I TRULY BELIEVE IN THE POWER OF PRAYER AND WE ARE ALL IN YOUR CORNER, IT IS RARE THAT YOU FIND SOMEONE WHO TOUCHES THAT PLACE IN YOU AND MAKES YOU WISH TO BE BETTER, YOU ARE A GIFT DEBRA!! A TRUE GIFT!! ((((hugs)))) I will be praying for you. I wish you the best of luck with your procedure. Don't worry about all of us....we'll be here when you are ready to log back in! And when you do, you will be healthy and happy and enjoying life with so much to write about! :) Hugs! I'm so glad for the update. My thoughts and prayers are with you! Thank you for the update! I've been thru open heart surgery, catherizations (on a monthly basis for a while), blood clots, the whole ball of wax. Once I found out the why and what was to be done, I was relieved. FAITH got me through this along with caring family and friends. Take care, you are in my and many thoughts and prayers. A doctor who actually listens to you means all the difference in the world in how you are dealing with things. Thank goodness! Thinking of you. I love this idea. I keep my most used tools in a vintage picnic box on my dining room hutch. I love having my tools handy and like that know one would suspect all that hardware is tucked in such a pretty case. I wish you nothing but a very good out come me on your heart surgery and so glad you found the young lady in st louis. Still sending up prayers for you. Wishing you a speedy recovery to a renewed health. Have a safe & happy 4th. You're in my prayers. Take it easy and concentrate on your recovery! Oh Debra. Please keep us informed, I'm sending you my prayers for a successful surgery. And I know exactly what you mean about there being more to life than beautiful "things". Yesterday was our 25th wedding anniversary and we spent it at a funeral for my 29 year old nephew who died tragically when a blot clot in his leg moved to his lungs. Needless to say it was a long, heartbreaking, exhausting day but what a reminder that life is precious. Your blog is delightful and I am now going to follow you! You will be in my prayers and thoughts! My husband has had 2 open heart surgeries and is doing very, very well. You will too! I am so happy you found someone that will listen and actually teach and help you! I wish you the best of luck in your procedure, you will be in my prayers....blessings, and happy 4th of July! I'm so glad to hear you've found a Dr. you feel comfortable with and that really listens to you, the patient! What a difference it makes when you find a Dr. you feel could 'be a friend'! Debra, I am so glad that you changed Doctors and that you feel good about this one. Sounds like she is very knowledgeable about your problem and knows what to do. Good luck on your tests. Have a Happy 4th of July and your are in my prayers for a speedy recovery.